The Lloydminster Fish and Game Association wanted to conduct a local project which would have the potential of improving the fishery in the area. 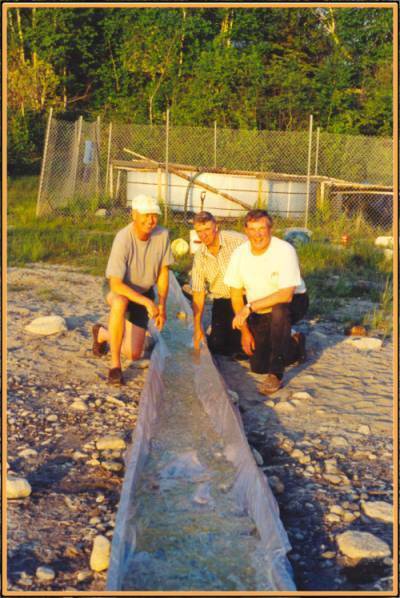 After talking to John Weir, fisheries biologist in the West Boreal Eco-Region, about the declining enthusiasm that Saskatchewan Environment has for rehabilitating and stocking “new water bodies”; it was felt that doing a project to significantly increase the success of present walleye stocking programs would be of benefit to not only a local fishery, but the technology could be used province wide. John’s theory was that present stocking has a high mortality rate because of starvation due to low productivity in lakes when the stocking must be done. So our main objective is to develop the methods and materials needed to inexpensively and significantly improve the survival rate of Walleye larvae to a healthy fry stage up to one inch. The Lloydminster Fish & Game Association wanted to conduct a local project which would have the potential of improving the fishery of the area. 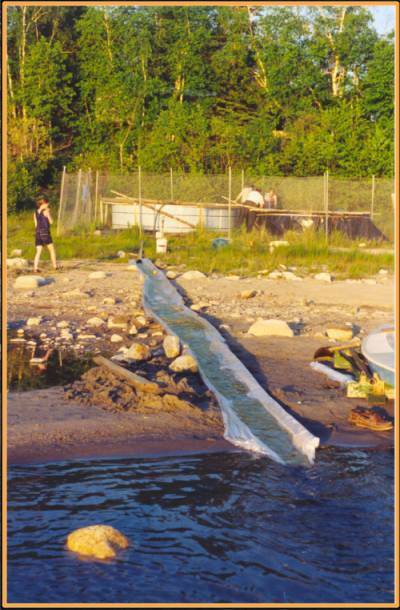 We have conducted the rearing pond for four years now with varying results. 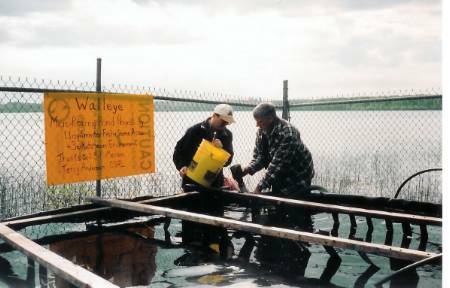 We had excellent results in 2002 and released thousands of vigorous fry into Peck Lake The Lloyd Fish & Game Association won the Ed Begin Branch Conservation Award in 2003 for the best project in Saskatchewan. nbsp; We were also awarded the Best Project Award for Alberta that year. The water levels at Peck Lake have constantly been dropping and now have made it impossible to release the fry into the lake from the micro-rearing pond. We are currently investigating the possibility of moving the project to Little Fishing Lake. 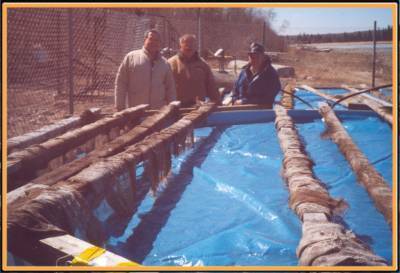 The Micro Rearing pond has been successfully moved to Little Fishing Lake and had a very good year in 2005. Following is some pictures of the release of the new little Walleye fry.